Celery is an asynchronous task queue based on distributed message passing. Task queues are used as a strategy to distribute the workload between threads/machines. 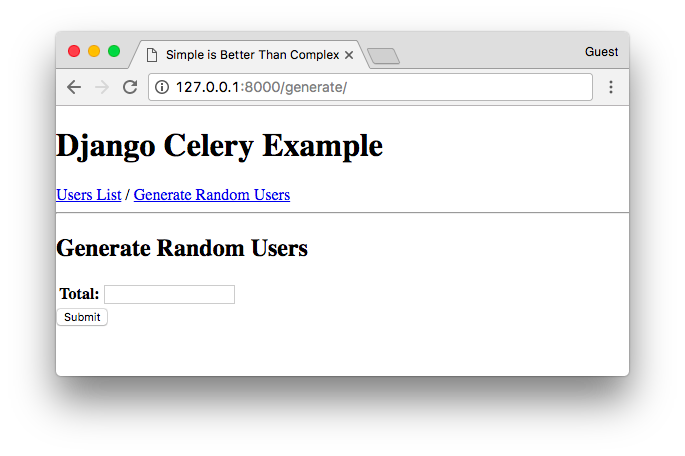 In this tutorial I will explain how to install and setup Celery + RabbitMQ to execute asynchronous in a Django application. To work with Celery, we also need to install RabbitMQ because Celery requires an external solution to send and receive messages. Those solutions are called message brokers. Currently, Celery supports RabbitMQ, Redis, and Amazon SQS as message broker solutions. Why Should I Use Celery? Web applications works with request and response cycles. When the user access a certain URL of your application the Web browser send a request to your server. Django receive this request and do something with it. Usually it involves executing queries in the database, processing data. While Django does his thing and process the request, the user have to wait. When Django finalize its job processing the request, it sends back a response to the user who finally will see something. Ideally this request and response cycle should be fast, otherwise we would leave the user waiting for way too long. And even worse, our Web server can only serve a certain number of users at a time. So, if this process is slow, it can limit the amount of pages your application can serve at a time. For the most part we can work around this issue using cache, optimizing database queries, and so on. But there are some cases that theres no other option: the heavy work have to be done. A report page, export of big amount of data, video/image processing are a few examples of cases where you may want to use Celery. We don’t use Celery through the whole project, but only for specific tasks that are time-consuming. The idea here is to respond to the user as quick as possible, and pass the time-consuming tasks to the queue so to be executed in the background, and always keep the server ready to respond to new requests. Now we have to install RabbitMQ. 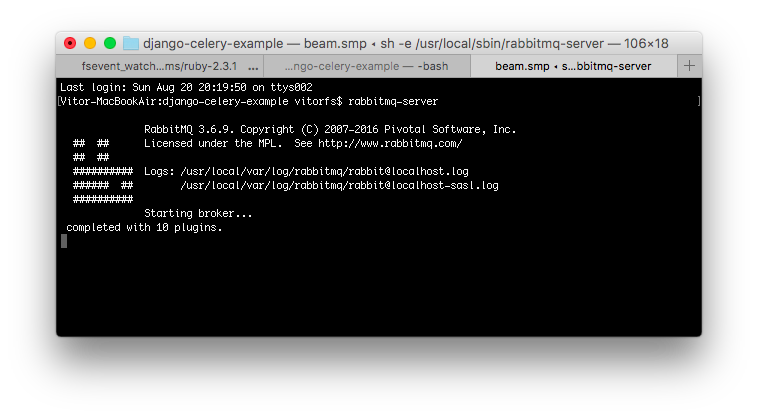 The RabbitMQ scripts are installed into /usr/local/sbin. You can add it to your .bash_profile or .profile. Restart the terminal to make sure the changes are in effect. Unfortunately I don’t have access to a Windows computer to try things out, but you can find the installation guide for Windows on RabbitMQ’s Website. For other operating systems, check the Downloading and Installing RabbitMQ on their Website. Alongside with the settings.py and urls.py files, let’s create a new file named celery.py. 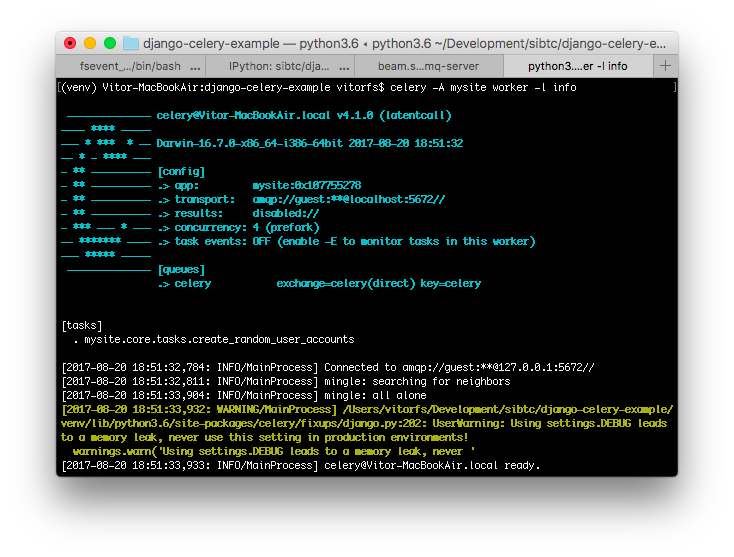 This will make sure our Celery app is important every time Django starts. We can create a file named tasks.py inside a Django app and put all our Celery tasks into this file. 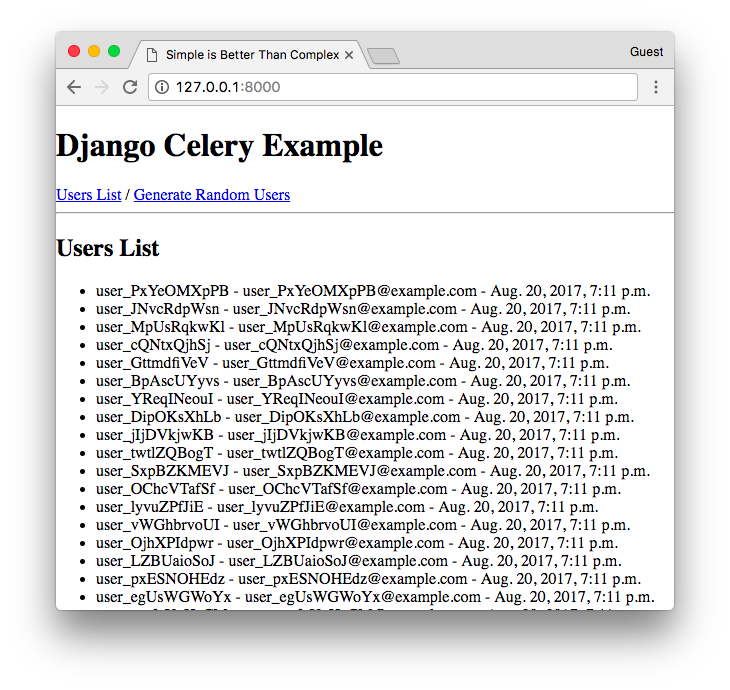 The Celery app we created in the project root will collect all tasks defined across all Django apps listed in the INSTALLED_APPS configuration. 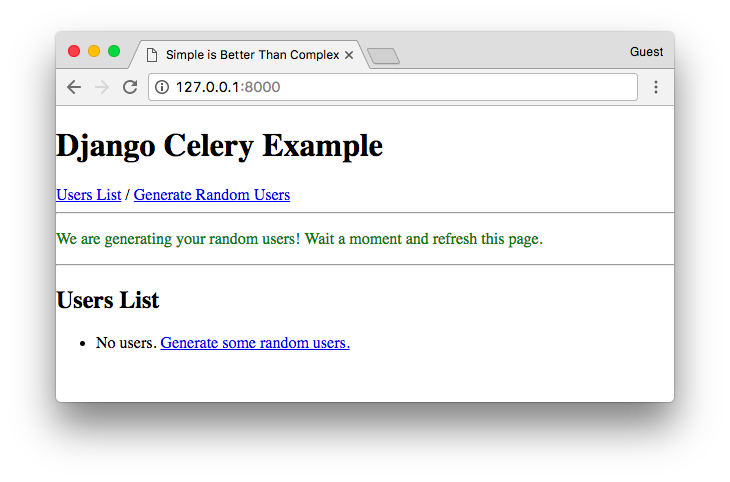 Just for testing purpose, let’s create a Celery task that generates a number of random User accounts. Instead of calling the create_random_user_accounts directly, I’m calling create_random_user_accounts.delay(). This way we are instructing Celery to execute this function in the background. Then Django keep processing my view GenerateRandomUserView and returns smoothly to the user. But before you try it, check the next section to learn how to start the Celery worker process. Now we can test it. I submitted 500 in my form to create 500 random users. If you are deploying your application to a VPS like DigitalOcean you will want to run the worker process in the background. In my tutorials I like to use Supervisord to manage the Gunicorn workers, so it’s usually a nice fit with Celery. In the example below, I’m considering my Django project is inside a virtual environment. The path to my virtual environment is /home/mysite/. If you are not familiar with deploying Django to a production server and working with Supervisord, maybe this part will make more sense if you check this post from the blog: How to Deploy a Django Application to Digital Ocean. If you want to try this setup in a Ubuntu cloud server, you can use this referral link to get a $10 free credit from Digital Ocean.